on May 1st, 2016 at 12pm CST. Visit https://chicagosketchseminar2016.wordpress.com to register and for all event information including pricing information. Membership to Urban Sketchers Chicago not required. All are welcome! Urban Sketchers is offering an exciting seminar on July 9th & 10th, 2016 to help everyone from absolute beginners to experienced artists develop the sketchbook habit, try new things, and practice sketching in public. Workshops will be taught in the sidewalks and parks of Chicago, giving ample opportunities for artist enthusiasts to practice sketching in the motion of Chicago. We hope you’ll join us! 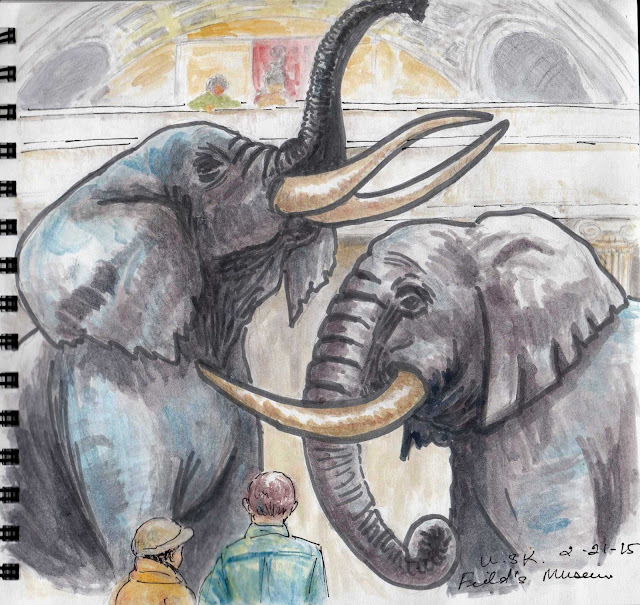 For our Spotlight Sunday featured artist, we are talking with Susan Hanley, an artist who joined Urban Sketchers Chicago just about a year ago. It was at the 2015 Chicago Sketch Seminar where I first met her and just now discovered that it was where she first joined our group. Since then, Susan has been prolific with her posting of sketches, not only in the USk Chicago Facebook group, but also on Instagram (@snh2030). It would seem that Urban Sketching has helped rekindle Susan's passion for sketching and painting and her confidence is soaring. She was one of the artists who participated in the Blicks Lincoln Park Art Show last year. Here is what else I learned about Susan and some of the sketches she is sharing with us today. WD: Hi Susan. Thanks for chatting with me here today. My first question is: Can you tell us how you learned about urban sketching and what convinced you to join Urban Sketchers Chicago? 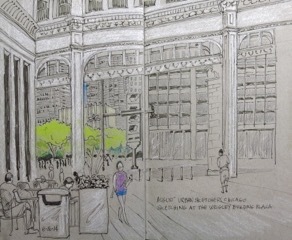 I learned about Urban Sketching from my son Tom who is a member. He was a student at the American Academy of Art and saw a presentation. I reached out to Andrew [Banks] and joined the group, but never attended any of the events. I actually felt a little intimidated to join in on the events and wasn't sure what to expect. When the announcement of the Seminar came out I decided that was my time to join in. It was a perfect way for me to learn more about the group and urban sketching. It's an extremely encouraging and welcoming group of people and the Seminar quelled any nerves I had about participating in future events. In fact, I haven't missed any since! WD: Well I hope you are not intimidated now. It's always fun to see what you will sketch next. Why do you sketch? And how does it help you? I sketch for several reasons; wanting to capture a scene, work out an idea or stress relief. The main reason, however, is that it completely engages a different side of my brain, a side that doesn’t get a ton of exercise on a day-to-day basis. The collaboration of eye to brain to hand is always fresh and interesting. Put different materials into the mix and there are never any two experiences that are exactly alike. In other words, never boring. Sketching is always challenging for me and presents little problems that I have to solve. I love the aspect of the unexpected. I have an image in my head of what the finished sketch will look like and it inevitably takes a different trail. One truth I’ve found is that I’m happy with the end result when I let it take on a life of it’s own and follow the detours. When I force a picture to stay on track and to look like what I had imagined is exactly how it winds up looking… forced. all absorbed while sitting and sketching. WD: What is your favorite sketching tool? This is a very tough question. I start every sketch lately with a mechanical pencil. My recent favorite is an Alvin Draftmatic. That paired with a kneaded eraser gets general proportions and composition. WD: Yes, I can see how much you feature that pencil in your posts. Those mechanical pencils are especially good when you don't want the lines to flair out on you. Where is your favorite place to sketch? The good old coffee shop is my favorite spot to sketch. There’s coffee, someplace out of the way to sit and tons of people on their cell phones not noticing me sketching them. Next favorite is doctor’s waiting rooms. Not that I enjoy waiting for doctors, but the sketching is a perfect distraction and a way of feeling productive while at the hands of someone else’s schedule. WD: I agree Susan. Sometimes when I see that other people are having a bad day, it puts me in a better mood. So I see you sent me a few wonderful sketches. What was the inspiration for the sketches you selected? The sketches I selected are special because not only am I happy with the end results, they capture a moment in time and by sketching them the memories are even more vivid than if I’d taken a photo or just committed them to memory. WD: I was so excited to check out the sketches you sent. Why are these scenes special to you? “Shakespeare Garden” is special to me because it’s a spot I’ve been sketching since I was in high school growing up in Evanston. Except for some trees growing much taller and blocking part of the scene, it’s mostly unchanged. It was a warm summer day and I can transport back to the sounds of the cicadas and the heat of the sun just by looking at this sketch. “Comet Café” is a favorite diner in Milwaukee. From the booths you can observe the people seated at the counter unobserved. I love all of the textures and details of the interior and the people tend to linger a while making it easier to finish their gestures. “Newberry Library” is the result of the Urban Sketch Seminar on the Velasquez Palette. This was my first experience with a limited watercolor palette and it was a picture that really felt like it had a mind of it’s own, but in the end I really appreciate all of the things that 3 pigments and some water achieved. Wildwood Water Tower” is a scene I drive by often. I love the structure of older water towers. They remind me of modern day ruins. The day was gray and stark, but the sketch isn’t bleak and that reflects how it felt. For me it captures a feeling of spring about to return. My day job doesn’t incorporate any sketching skills. However, I feel like the problem solving that you develop in sketching does help me. I can pull back, see a bigger picture and decide what I want to focus on. All skills you hone in sketching. 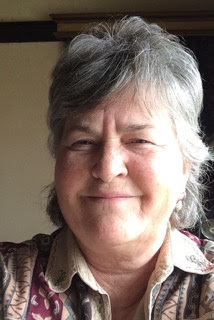 WD: We are so glad to have artists like you, Susan, in our group because you have found an active group of friends who have helped you to rekindle your love for sketching and painting. Thank you, Susan, for sharing your time and your sketches with us. Spotlight Sunday is series of interviews designed to introduce and highlight Chicago Urban Sketchers individually. Now that our chapter has reached 500 members it has become more of a challenge to meet every member in person and have a conversation. These posts concentrate on individuals and speak in their own words and sketches. All sketches are ©2016 Susan Hanley. Thank you to everyone who has joined our group, sketched with us at monthly sketch events and has helped make Urban Sketchers Chicago a fantastic, amazing, super talented and caring community! Let's see the world, one drawing at a time - together! 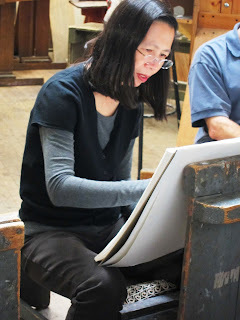 Interested in becoming a member of USk Chicago? 3) A USk Chicago administrator will send you a Facebook message. Please keep an eye out for this and respond within 7 days. USk Chicago administrators greet all new requests, to answer any questions about our group. Our chapter is a regional chapter, accepting membership from those who live in Illinois, SE Wisconsin, NW Indiana, and SW Michigan. Tag your posts with #USkChicago and help us continue to share our group with our community! Spotlight Sunday is series of interviews designed to introduce and highlight Chicago Urban Sketchers individually. Now that our chapter has reached nearly 500 members it has become more of a challenge to meet every member in person and have a conversation. 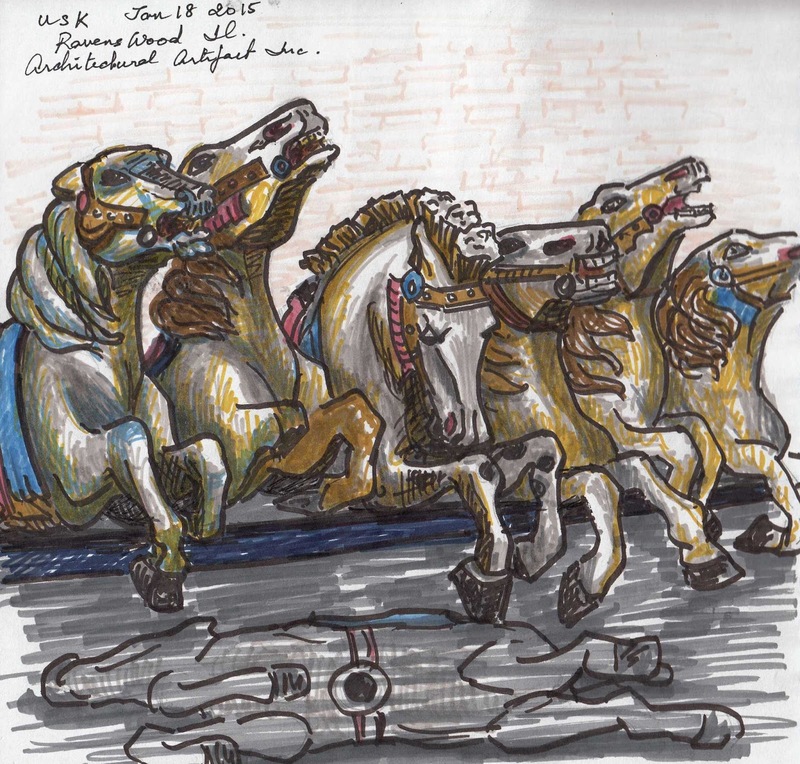 These posts concentrate on individuals and speak in their own words and sketches. Urban Sketchers for a long time! I remember sketching with you in 2012 at the Buddhist Temple. It’s more than time for the spotlight to shine on you! Tell us a little about yourself. Amy Larsen: I’m a freelance graphic artist, mom and grandma. I’ve always loved animals, nature and art. My interest in drawing and painting started as a young girl and stuck with me through the years. I have studied watercolor painting at Dillman’s where my teachers include the very talented artists David Taylor, Rose Edin and Ken Hosmer, and various classes at The School of the Art Institute. AL: I discovered Urban Sketchers online before there was a Chicago group. So as soon as I saw the group forming I joined up. I sometimes search online for sketches and sketchbooks, because I love looking at them, which led me to the Moleskine sketching groups, and then to Urban Sketchers. BW: I think there are as many different reasons to sketch as there are sketchers. Why do you sketch? AL: Three things come to mind. I enjoy time spent losing myself in the activity. The challenge of depicting a scene. And the beauty of light and shadow on form. BW: Do you have a favorite subject? Why? AL: I’ve been enjoying painting botanicals lately. Flowers and plants have the qualities I like; beautiful colors, graceful forms and the effects of light and shadow. AL: I have always loved watercolor. I love it for its simplicity and luminosity. But I love markers and pastel and oil paints too! I think it can be beneficial to switch it up sometimes. AL: Well, I love being able to bring any medium and every color on my sketching trip in one slim package. The new apple pencils pressure sensitivity has made drawing on the iPad much more fun. I haven’t even scratched the surface of all it can do. It’s just a matter of one’s own creativity. Drawbacks? I wouldn’t want to drop it! AL: No specific place. Traveling anywhere with other artists would be a dream come true. River cruise down the Rhine anyone? Someday I will. BW: That river cruise is on my list, too. When you’re not sketching what do you enjoy doing? AL: Fooling around with the iPad! Scrolling through my Facebook feed. Snuggling with my dogs. Watching movies. Listening to music. Taking pictures around the area. Cooking. Gardening. BW: A Renaissance Woman! We know you’re on FaceBook, do you have other social media accounts where we can view your work? (Twitter, Instagram, Pinterest etc.)? BW: Thanks, Amy, for sharing your sketches and thoughts with all of us! For this week's Spotlight Sunday I interviewed Chicago sketcher Muriel Christensen. I love Muriel’s sketches, portraits and her use of bold color. Thank you for answering my questions, Muriel! Alex: How did you first hear about the Urban Sketchers community and what made you decide to join Urban Sketchers Chicago? Muriel: On Facebook. I believe it was a pop up on the recommended page. I decided to join since I wanted to enhance my drawing skills. The best way is from live drawings and I'm not very comfortable doing that alone in public, so why not join a group and sketch together. I also wanted to do sketches other than portraits. 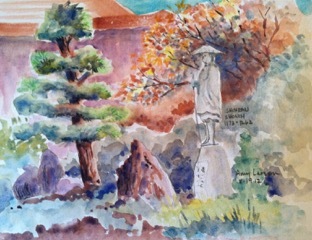 My husband is not a sketcher, but joins me regularly, since he enjoys venturing out to the places that we did not know exist. Maybe he'll pick up a sketchbook and a pencil one of these days. Alex: When did you start sketching? Muriel: I've been sketching and drawing since my childhood, don't remember the age. But mainly portraits or people and mainly from photos. I remembered selling my sketches for 10 cents (Burmese currency) in my first grade and gotten into trouble with their parents. So, from first grade for sure. I stopped sketching or doing art during my adulthood, busy with schooling and raising family. But started doing it seriously again after joining USK. Alex: Funny about selling your sketches and getting in trouble! Did you have any formal training in art, drawing or painting? Muriel: Unfortunately, no. Do the workshops count? 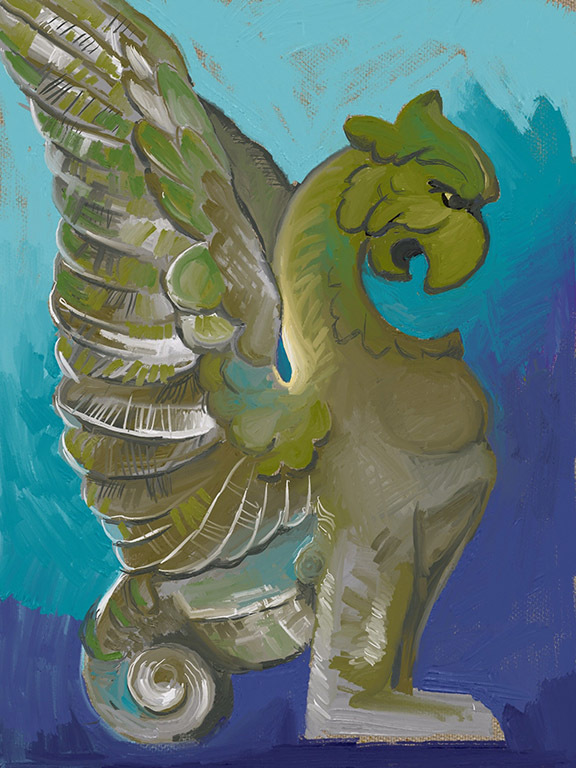 I took several oil painting workshops at Palette and Chisel. My dad was a very good cartoonist and was a professional artist when he was single, but gave it up when he got married. His art only exists in my memory as all of his work was destroyed in the fire in Burma. I did not learn much from him as his style was more gestural, drawings which I foolishly did not appreciate at that time. He gave me some pointers when I was young, but never encouraged me to go into art. Not trying to be stereotype here, ‪but I think this was a common thing in Asian culture. Alex: What are your favorite subjects to sketch? Muriel: I'm into portraits and figurative. People are my favorite. Alex: What are your favorite sketching tools? Muriel: I've been experimenting with different tools. For sketching, micron pens, markers but started using watercolor after seeing several great watercolor sketches from USK members. Alex: Do you have a website, blog or social media accounts where people can see more of your work? I also have a Facebook art page for friends to view. Link to FB page is https://www.facebook.com/MACPortraits or the FB page is called Muriel Christensen Art. Alex: Does your regular “day” job involve drawing? Does drawing help you in your life? Muriel: No, I wish. My job is mainly technical. I believe my drawing and artwork helps me release some of my day-job stress. It helps in a therapeutic way. Drawing helps me to see things and it helps me to appreciate every day ordinary objects. It is now my visual journal or diary and I take the sketchbook wherever I go. Alex: Thank you for sharing, Muriel! I appreciate your time!